Vahap Avşar, Negatives, 1990. Print on dibond, 105 x 70 cm (each). Vahap Avşar’s practice is slippery—an acutely self-aware narrator of his own work, his politics is direct, his visual language overt. Avşar’s work ranges in media, including painting—realistic and abstract—, sculpture, installation, and performance. His methodologies reflect a similar diversity, combining humorous punchlines with harsh political realism, realist representation with performance. He has photocopied his hands, made paintings of asphalt, positioned himself in art history with Joseph Beuys and Cengiz Cekil, sent postcards labeled Forbidden Zone producing a transit that was forbidden itself, manufactured sweatshirts that said Guantanamo. In the below article, Pınar Öğrenci identifies and exposes Avşar’s modus operandi, which is based on the visual mimicking of that which we are used to articulating only verbally. The tension between the visual and the verbal, this specific discomfort is precisely what the artist thrives on. Vahap Avşar, Black Album, 2013. 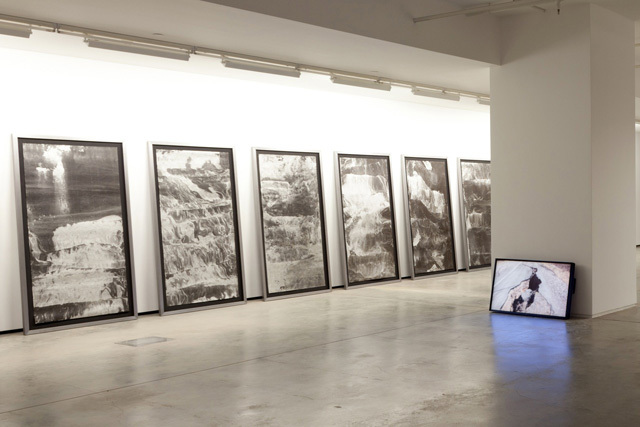 Installation view at Rampa, Istanbul. Two days after having seen Vahap Avşar’s second one-person exhibition at Rampa, I went to Van, where I was born and raised. In the exhibition curated by Esra Sarıgedik Öktem, Avşar conceptualized the relationships of politics and power that has been engraved in our memories through images new and old, using a variety of media including painting, video, and sculpture. I thought about this exhibition on the plane to Van and while looking out the window at Mountain Arek. In this city where time seems to flow slowly, I wanted to interpret the possible relationships between Avşar’s works and our political history. The work which left an indelible mark on my mind was the video Road to Arguvan (2013). 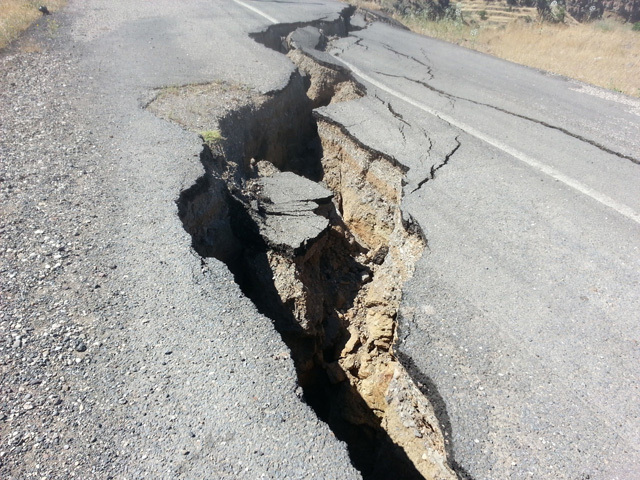 The video is of a deep crack on the road which the artist encountered during his trip to Malatya. The fact that the video was filmed using a single moving camera passes on this feeling of coincidence to the viewer. The weak spot of the whole piece is this image of the crack, which is quite powerful as a concept in a geographical region which is as troubled as ours. It makes us think first of all about the chasms in our social memory, our political history, and those it has left out—our unwritten history which attempts to seep in through the holes it finds, and grows more as it seeps through, and envelopes us. This fracture, which was created suddenly, with no apparent earthquake or landslide, as if by “fate”, is just like a window which has been opened in order to be able to look at the unwritten history of the geography of the region of Anatolia. Vahap Avşar, Road to Arguvan, 2013. Single-channel video, 00:02:18. Road to Arguvan and the metaphor of the crack reminds me of the Van earthquake, which I have not been able to erase from my memory. After the earthquake, towards the end of the relief effort, we had stayed at the Bayram Hotel. The walls, the columns, the beams were full of cracks; the repairmen were plastering these cracks and painting over them. Hotel personnel were trying to cover up the cracks by placing huge artificial flowers in front of the walls which were yet to be repaired. Despite my objections, we stayed at this hotel; it seemed that we had no choice. The hotel collapsed in the second big earthquake just a few days after we left, and 24 people lost their lives. We should not underestimate underground movements as something trivial; sometimes these types of movements uncover the truths which have been papered over, and the world turns upside down. In the aftermath of the Van earthquake the remains of structures were discovered underneath the ruins of some of the houses. These structures are thought to have been built by Armenians to be able to hold rituals in secret, as they were forced to change their religion following the genocide. Even though it has not yet become certain which period these remains belong to, the probability of the accuracy of the assumptions is very high. The statement of the Habertürk presenter, “even though [the earthquake] took place in the east of the country, we are sad,” and the stones and flags that came out of the aid packages, made the secret hostility within society, evident. However, this created a kind of “confrontation”, mobilizing consciences, and ultimately—just as it had happened in the Düzce earthquake—led to an exhibition of incredible solidarity. At the end of the video we see a television set which has been thrown into the fracture. I first ask myself why there is a television on the road, but when I think about it, I realize that there is no hole that television has not gotten into. The indicator of the age of miscommunication, the jewel to our homes—the television. The misinformation that the television relayed produced deep fractures in our shared memory. Avşar conceptualizes themes that the television expertly employs—violence, war, fear, guns, assassination or news of attacks—all of which the viewer has become desensitized to with frequent exposure. 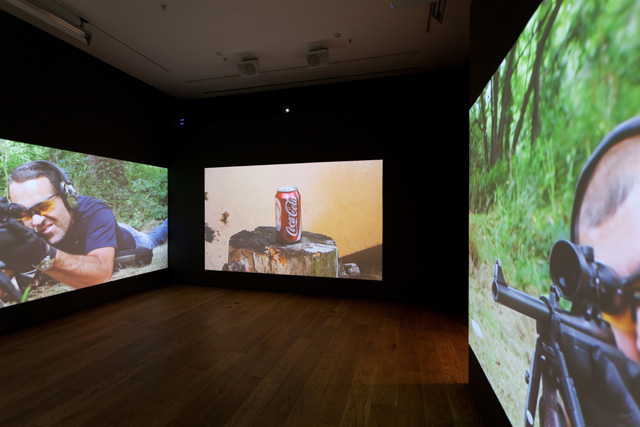 Avşar draws attention to these situations through art—we might be desensitized as viewers, but war and violence do not cease to exist. Within the context of the exhibition that interrogates the relationship between violence and power, the TV’s existence in the well formed by a fracture is quite compelling, implying the end of the TV era. The series eponymous with the exhibition, Black Album, was formed by the spreading and freezing of metallic silver paint applied to tarred felt. Avşar says that he was inspired by his night time journeys to the east, in particular to the snow-covered mountains. When he was on the road, images would flow by and this is related to movement and speed (we could again think about the relationship to TV and cinema here.) This “fluid” situation in the Black Album invokes memories of all mass movements, under the specific characteristic of the Gezi Park resistance. Because it counters a situation which is fluid, restless, which seeps through the holes it finds, cascades thick and quickly from time to time, and just keeps on going. The heap of energy that accumulates somewhere, ready to explode, the impossibility of controlling social upheaval when it flows into the streets and the affinity between the artist’s application of a bucket of metallic paint onto the felt with the built-up tension, could be interpreted as Avşar’s expression of social transformations that he has witnessed over time. The coincidentality, spontaneity, self-formation and incontrollability of the affairs invokes memories of Gezi Park resistance, uprisings in the Middle East, and endeavors of the Rojovan Kurds to form a state. Vahap Avşar, Shoot-out, 2012. Video installation. The fluidity in Colour Stream is made stronger in juxtaposition with the Black Album. While I thought these works were made recently, I learn from Avşar that the work is from 1994. While Black Album uses grey tones, color comes in with Colour Stream. The video invokes memories of the posters of rivers and waterfalls which were used on the walls of houses, places of work, and in particular the coffee shops of the 60s in the context of the “stereotypes” (children of crying children, Atatürk, and soldiers) frequently used by Avşar. Water, whilst it mostly flows with its color unchanged, begins to transform after a while. I make a secret connection with the work composed of the blood filled drums, which was ruined during a short-lived exhibition at the Ankara Station Building in 1990. I’m also reminded of witness accounts of rivers flowing a bright red for days following the Armenian and Kurdish massacres. I can say that the changing color of the water brings to mind the chemical state of the environment which has become polluted by human hands, and draw the matter to a relatively less stern, but still very important area. When a minister recently said, “we will no longer deal with little streams,” we thought he was saying something positive, but he was just underlining that hydro-electrical power plants (HES) were no longer enough, and there was a growing need for nuclear energy. Asphalt has become the hallmark of the exhibition—both as a material and as an image. It confronts us as the binding material and the material on the road on top of the crack or chasm in Black Album, and the byproduct which is reminded to us by the burning petrol in Shell. When we consider the war in the Middle East for oil in terms of automotive production—one of the main cogwheels of capitalism and road building (this also ovarlaps with Avşar’s desire to build roads)—, asphalt makes its presence felt as a powerful metaphor. The black color of the asphalt names the exhibition while the fluidity of the material relates to the notion of mobility and movement that is addressed the whole of the exhibition. In 1979, Avşar’s family was attacked in the small hours. This is a kind of intimidation and it is successful—the family leaves Malatya. 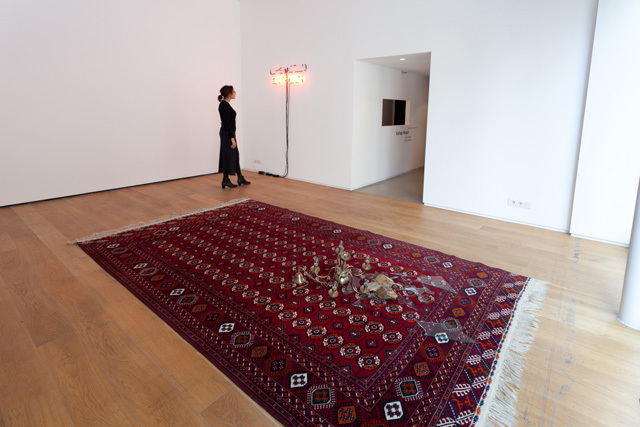 Final Warning (1993/2013) relates the story of the family’s immigration to Izmir following the attack, which had caused windows and chandeliers to be shattered. It also points to a breaking point in Avşar’s life as his first migration, connected strongly to the concept of mobility. Space is not only physical, but also psychological and image-based and for the artist; it is visualized through his personal memory. The individual’s social identity, the ability to adapt to society and space is built up through the feeling of familiarity and security. Could we form a relationship between the chandeliers and broken glass on the carpet and his drones that were vandalized in the Ankara Train Station? In Avşar’s Negatives (1990) series formed by x-rays that he collected from hospitals, could the dirty hand on the children’s faces be a symbol of the violence in society? Leakage, explosion, splitting or cracking, brakage and descent… We are faced with a good number of physical phenomena. It all counterbalances a movement and transformation. None of these alludes to a solid state; in contrast, there is something in this exhibition which separates, breaks off, flows away, explodes… Almost like the formation of the world; sliding, shifting backdrops; the creation of the oceans, seas and streams, exploding volcanoes, volcanic mountains and lakes… Avşar’s art is transformative as the concepts that he represents are completely and utterly deconstructed. This transformation that the concepts have undergone contribute to the aesthetic of the works, enabling the reading of the works lyrically. In order to make the malaise better, first you need to get to know it, and then confront it. It is as if Vahap Avşar is taking an x-ray of our diseased world with the Black Album. An earlier version of this article was published in Agos, December 2013. Vahap Avşar’s Black Album was exhibited at Rampa, Istanbul, November 22, 2013-January 4, 2014. Vahap Avşar, Final Warning, 1993 / 2013. Installation view. Pınar Öğrenci (b. 1973, Van) resides in Istanbul, has a degree on architecture from Yıldız Technical University and master’s degree on restoration from the same university. She has transformed her architecture office MARS into an independent art space for exhibitions on architectural research and has been invited as guest artist to Frise-Hamburg, Willa Waldberta-Münih ve Altonale Fest-Hamburg programs. The artist’s critical writing on art and architecture have been released in publications such as Arredemento Mimarlık, İstanbul, XXI, Ahşap, Natura, Agos, Arkitera and her research has been included in books titled “Ottoman Architecture, Late Period” and “Anatolia Moderna.” Her work has been exhibited in Santral İstanbul as a part of the “1910-2010 İstanbul” exhibition and referred to in seminars held in French Institute for Research on Anatolia and Studio X Istanbul. Pınar Öğrenci, who has curated Crystal City, Utopia Collection and Unfounded exhibitions in Istanbul, has been invited to CIMAM conference held in Rio de Janeiro in 2013. Öğrenci has realized her first solo exhibition within Altonale-Fest guest artist program and has taken part in expositions such as Learned Helplessness (Bergsen&Bergsen, İstanbul), Homo Homini Lupus (M1186, Ankara), Die Neu Eröffnung (Halle10, Münih), Floating Volumes (Frise-Hamburg/5533-İstanbul), Reality Terror (Depo, İstanbul) and Soft City (Alan İstanbul). Vahap Avşar (1965, Malatya) attended Dokuz Eylül University Faculty of Fine Arts from 1985 to 1989. There, he met Cengiz Çekil and worked as his studio assistant. Upon graduation, Avşar moved to Ankara to work as a research assistant and to attend Bilkent University Fine Arts Department where he earned his Master’s degree and completed the course work for his Ph.D. Avşar settled in New York after an artist’s residency program in 1995. Avşar’s solo exhibitions include “Black Album”, Rampa, Istanbul (2013), “iBerlin”, TANAS, Berlin (2012), “Noneisafe”, Charles Bank Gallery, New York (2011) and “Vahap Avşar”, Rampa, Istanbul (2010), “Come Who Ever You Are”, W139, Amsterdam (1993) and “Myths”, Galeri Zon, Ankara (1991). His group exhibitions, among others, include “Zwölf im Zwölften, TANAS, Berlin (2011), Second Exhibition, ARTER, Istanbul (2010), “I’m Too Sad to Kill You!”, Proje 4L, Istanbul (2003), 5th International Istanbul Biennial, Istanbul (1997) and “Gar”, TCDD Art Gallery and Ankara Central Train Station, Ankara (1995), 5th Havana Biennial Art Exhibition (1994), “Elli Numara – Anı Bellek II”, Akaretler 50, Istanbul (1993) and “An Another Art: For the Memory of Joseph Beuys”, German Cultural Centre, İzmir (1986). Avşar lives and works in Brooklyn, New York. Posted in content, on artists and tagged Black Album, Last Warning, Merve Ünsal, Negatives, Pınar Ögrenci, Rampa, Road to Arguvan, Shoot-out, Vahap Avşar. Bookmark the permalink.